After giving the back of your top a really good press, lay the top flat with the back facing up. Close the centre back opening and position your button so that the button loop will go around it comfortably without pulling, being sure to check the top corners of the opening are in line. Use a pin to mark the position of the button on the top. Use tailor's chalk or an erasable fabric marker to mark the position so that you can remove the pin. Take some thread and tie a knot in the end. I like to use a thick thread (like the one in the photo) or a normal thread doubled. Place your chosen button onto a tooth pick (or similar) and sew the first stitch to secure it. We are using a toothpick under the button so that the button will be slightly raised off the fabric, which will mean it is easier to secure the button loop around it, and the loop won't slip off the button. Making sure the button is straight, secure the bottom of the button with another stitch. Continue stitching the button in place, keeping your stitches nice and close together on the back so that it remains neat on the inside as well as the outside. Once your button is secure, remove the toothpick from underneath the button. Take the needle to the inside of the top, by putting the needle through the fabric underneath the button. Bring the thread up through the wrong side of the top, underneath the button. Make a small knot in the thread by making a few small stitches and putting the needle and thread through the stitches. To secure the end, put the needle into the fabric under the button and bring it up about 2-3cm (1in) under the button on the centre back of the top. Cut the thread so that it drops back inside the top (between the top and the facing) so that you cannot see the end. And admire your work! Your button is in position. The final step you need to do to complete your Collins Top, is to stitch down the all-in-one facing. I showed you in this tutorial how to attach the facing, but at this point it can still be flipped up from the neckline and armholes. With the top inside out, give the facing a good press. You want to slightly roll the neckline and armhole seams in, so that are on the inside of the top (the understitching will help with this). Pin the front facing in place on the two panel seams. Do the same on the back, as well as at the side seams. Working your way around the top, stitch the facing to the seam allowance at each point pinned. Make your stitches slightly above the bottom of the facing, so that when the facing is turned down, the stitches are hidden underneath it. And that's it. Your Collins Top is finished! 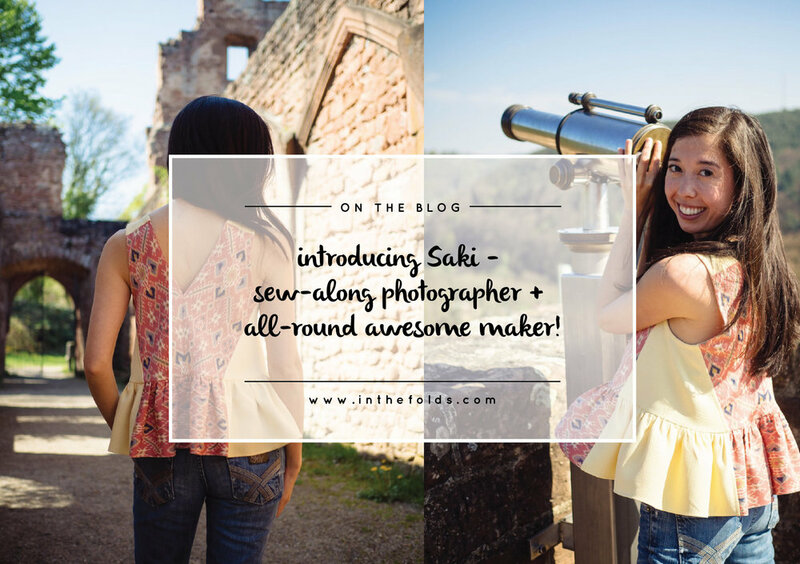 I hope you have enjoyed following along with these posts and have learned a new skill or two! Posted on July 20, 2017 by Emily Hundt and filed under sewalong, the collins top and tagged collins top sewing sewalong sewing tutorial. Take a length of binding at least 5cm (2in) longer than the circumference of your hem (this can be store-bought or self-made bias tape). Fold one short end under by about 2cm (¾in) and begin pinning the binding to the hemline with right sides together. Continue pinning the binding until the end of the bias strip overlaps the beginning of the bias strip. Trim off any excess. Stitch in place with a 1cm (⅜in) seam allowance. Trim down the seam allowance down by about 5mm (¼in). Flip the binding to the right side, and with your fingers, press the seam allowance towards the binding. Understitch the seam allowance to the binding. Turn the top inside out and flip the bias binding to the inside of the top. Fold the raw edge of the binding under before pressing and pinning in place. Sew hem by stitching binding in place, close to the folded edge of the binding. Give the binding a good press from the right and wrong side. Posted on July 19, 2017 by Emily Hundt and filed under sewalong, sewing tutorials, the collins top and tagged sewing tutorial sewing collins top sewalong. To start, take the FRONT and BACK FACING pieces and finish the bottom edges with your chosen method. For a really beautiful finish, consider using bias binding (do this Hong Kong style to reduce bulk). With right sides together, pin the BACK FACING pieces together, from the notch down only. The upper part of the seam will be left open, as this will be attached to the centre back opening later on. Stitch the seam with a 2cm (¾in) seam allowance, being sure to backstitch at the notch. With right sides together, pin FRONT and BACK FACING together at the shoulder seams. Stitch with a 1.5cm (⅝in) seam allowance. Create the button loop and attach to the top using this tutorial. If you would prefer to make a hand-stitched button loop (pictured above), check out this tutorial. 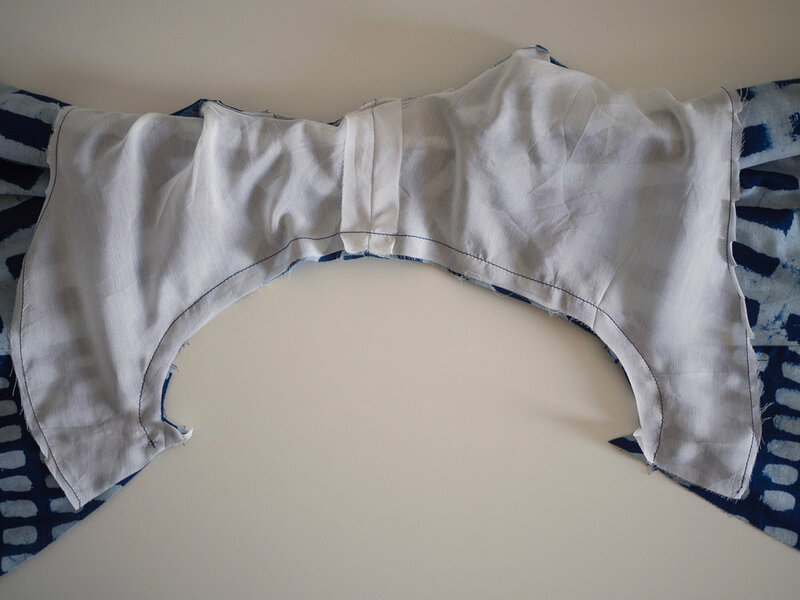 With the top right side up and the shoulder seams flat, turn back the centre back seam allowances on both sides of the opening, so that they are sitting flat (not folded inside the top). With the centre back seam allowances still pressed open, place the facing right side down on to the top (FRONT FACING on the front of the top and BACK FACING on the back of the top), matching the neckline and shoulder seams (the centre back seam allowance on the facing also needs to be flat and not folded). Pin the necklines of the facing and the top together. When you reach the centre back opening, check that the seam allowance is still pressed open on both the top and the facing. Pin the facing to the top, down each side of the opening until you reach the point where the centre back seams are joined on both the top and the facing. Sew the facing in place by stitching up the centre back seam on one side - with a 2cm (¾in) seam allowance (you should be able to follow the crease created earlier), starting at the point where the centre back seam stops. Continue up one side of the opening until you reach the point where the centre back seam allowance meets the neckline. Pivot your machine foot using the needle, so that you can turn the corner and stitch around the neckline. Reduce to a 1cm (⅜in) seam allowance around the neck, before going back down the other side of the centre back seam (again with a 2cm / 3/4in seam allowance). Before continuing, check that the button loop has been secured correctly by lifting the back facing. Trim, clip and grade the seam allowance by 5-6mm (¼in). You can also clip back the corners at the centre back. Turn the facing to the inside of the top and use a corner turner (or pencil) to turn out the corners at the centre back. Understitch the seam allowance to the facing. To do this, lift the facing and press the seam allowance towards the facing with your fingers. You can then understitch the seam allowance to the facing (this will help the facing remain on the inside of the top), before giving it a good press. You won't be able to stitch all the way to the centre back. Just get as close as possible. To sew the facing and the top together at the armholes, take the top and lay it out flat with the right side facing down. Take one side and carefully roll up the top, towards the opposite side. Continue rolling the top until you reach the start of the shoulder seam on the other side (the end closest to the neckline). With the top still rolled up, flip the facing back towards you, so that it lies on top of the rolled fabric. Lift the roll and flipped facing, and turn the remaining side of the top right side up, so that the armhole of the top can now meet the armhole of the facing (with the rolled up fabric in between). Line up the shoulder seams and pin in place. Pin the top and facing together at the armhole, using the shoulder seams and notches as a guide. Stitch the armhole with a 1.2cm (½in) seam allowance (being careful not to stitch through the rolled up fabric). Grade the seam allowance before clipping into the curve. Gently pull the rolled section out through one side of the facing to turn top and facing right side out. As the facing is already attached at the neckline, you won't be able to understitch the armhole all in one go. Understitch the armhole seam allowance to the facing by lifting the facing on the front armhole and sewing in from the side seam on the front and getting as close to the shoulder seam as possible. 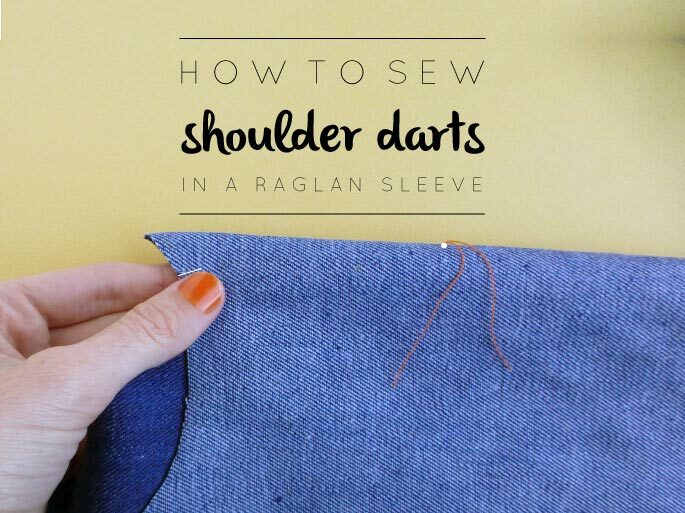 Repeat for the back armhole by stitching from the back side seam around the armhole towards the shoulder seam. Repeat the previous steps to attach the top and facing on the other side. Give the neckline and armholes a good press. With the top inside out, flip up the facing so that you can access the side seam of both the top and the facing. Pin the side seam of the facing and continue down the side seam of the top. Stitch the side seam with a 1.5cm (⅝in) seam allowance and press the seam allowances open. Stitch the side seam with a 1.5cm (⅝in) seam allowance and press the seam allowances open. And that's it for today's post. I hope you enjoyed it and learned something new! Posted on July 17, 2017 by Emily Hundt and filed under sewalong, sewing tutorials, the collins top and tagged sewing tutorial sewing collins top. Take the top and place it right side up, with the shoulder seams flat. Turn back the right side of the centre back opening, so that you can access the left side. Place a pin horizontally 1cm (⅜in) down from the neckline to mark the position of the button loop. Thread a hand needle and tie a knot in the end. You can choose to use a thick thread (what we used for this tutorial), or you can double thread your needle so that you have four strands of thread. Put your needle through the fabric from the wrong side, at the point where the pin marks the button loop location. Position your button where it will be sewn and loop your thread around it, to work out the amount of thread you require for your loop. Insert your needle into the fabric on the same side that you started, but about 1cm (3/8in) down from where you started, creating a loop (although this distance will depend on the size of your button). For example, if your button is only 5mm, then the top and bottom of your loop should only be about that far apart. Being careful to hold your loop of thread firmly (so it remains the correct size), flip your fabric to the wrong side (the side that your thread is now on). Still holding the loop firmly, put your needle back in the fabric, close to the point where your thread came through. Pull the thread through to the right side of the fabric. Take your thread back to the point where you started, creating a second loop. Make a small knot on the inside of the garment to secure the loop. 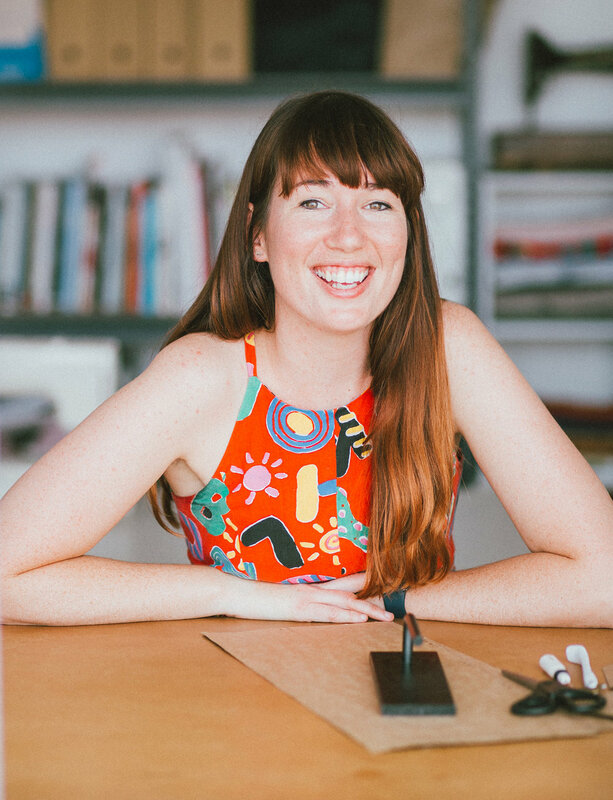 Bring the needle (and thread) back to the right side of the garment. You are now going to make your button loop using blanket stitch around your loops. To form a blanket stitch, insert your needle into the button loop, creating a circle with the remaining thread. Once the needle is through the button loop, put it over the thread of the circle. This is quite a difficult process to describe in photos, so if you are new to this technique or stitch, check out this youtube video. Pull the thread tight to form your stitch. Once the stitch is formed, push it to the base of the loop. Continue making blanket stitches, stacking one on top of the next, until you reach the end of the loop. Take your needle and thread to the inside of the garment and then secure the thread with a knot. And there you have it. A beautiful button loop to give you a very beautiful finish! Again, if you would prefer the quicker button loop, check out this tutorial. Posted on July 14, 2017 by Emily Hundt and filed under sewalong, sewing tutorials, the collins top and tagged collins top sewing sewing tutorial. For the sake of the Collins Top where you are guided to use lightweight fabric, a bias bound seam will work well. I'd suggest though, that if you were making a garment from a thicker or bulkier fabric, using a traditional Hong Kong bind (in the case of a Hong Kong bind, the underside of the binding is not folded and enclosed, but left raw to minimise bulk). 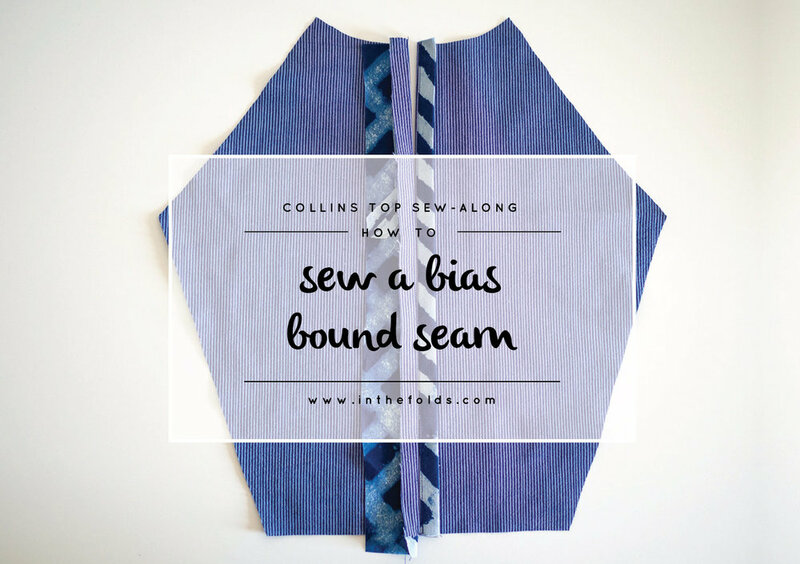 To get started there are two ways you can go about sewing a bias bound seam. You can bind the raw edges of the pieces you are joining before you sew the seam together, or you can sew the seam and then bind the raw edges. It really is a matter of preference and by the end, both options will look the same. It is easier to bind the raw edges before sewing the seam, but if you are sewing a really long seam (if you are using this tutorial for a pattern that is not the Collins Top), you may join the seams first to prevent any stretching or pulling. For this tutorial you can use store bough bias binding, or you make your own from your choice of fabric. Cut some bias binding 32mm wide (1 1/4in) wide. 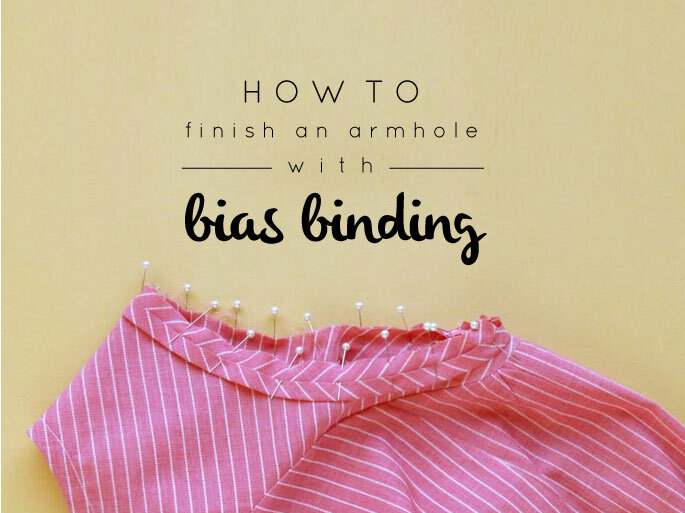 If you would like some help with how to go about making your own bias binding, you can check out this tutorial which will guide you through the (very easy) process. Cut a piece of binding that is a little longer than the edge you are binding. With right sides together, pin the binding to the seam you are binding (in the case of the Collins Top, it is the centre back seam). Stitch the binding in place, sewing with a 1cm (3/8in) seam allowance. Press the seam open, with the seam allowance pressed towards the bias binding. Flip the panel so it is right side down and carefully trim down the seam allowance by about 3-4mm (1/16in). Press the other long raw edge of the binding under by about 1cm (3/8). Fold the binding in half so that the binding wraps around the raw edge, the fold of the binding just overlapping the original stitch line. Carefully press and pin in place. Carefully stitch the binding in place by stitching a pin width away (about 1-2mm) from the folded edge. If you have an edge stitch foot for your machine, this is a good time to use it! Give the binding a good press and admire your handiwork! You can see that your seam looks beautiful and clean from both sides. You can repeat the process for the other side of the back, and then stitch the seam as normal. When you press the seam open you will see your beautiful bound edges! Pin and stitch the centre back seam allowance according to the instructions. Pin from the upper notch (13cm / 5in down from the top edge) to the bottom edge. The upper part of the seam will be left open, as later on we will be adding a button and loop closure to make this section the opening on the top. Stitch the seam with a 2cm (¾in) seam allowance, being sure to backstitch at the notch. This will ensure the centre back opening stays nice and secure. Please note: in the photos one side of the seam has already been bound. Disregard and follow the instructions for one side of the seam and then repeat for the other. Press (just with your hands) the seam allowance on the left side of the opening towards the seam allowance on the right side of the opening. 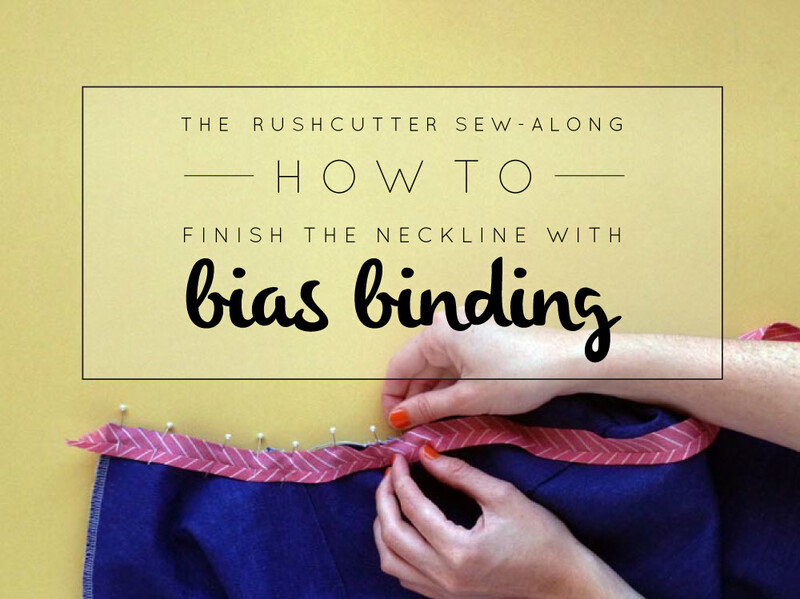 Take a length of bias binding approximately the length of the seam. Pin one edge of the binding to the raw edge of the seam. Flip back the seam allowance to check that you have only pinned through the two layers and haven't printed through any of the layers underneath. Stitch the binding in place, sewing with a 1cm (3/8in) seam allowance. Before stitching, make sure the other layers of fabric are out of the way. Press the seam allowance towards the binding. Press the raw edge of the binding in towards the raw seam by about 1cm (3/8). Wrap the bias binding around the raw edge, bringing the fold so that it overlaps the original stitch line. Press and pin in place. Continue pressing and pinning until the binding is in place on the whole seam. Flip the seam allowance open so that it is sitting flat (and there are no other layers of fabric underneath) and stitch the bias binding in place by stitching close to the folded edge. Press the seam allowance open and there you have it. You will see that the finish looks the same now as technique 1. There you have it... A beautiful way to finish your centre back seams! Posted on July 7, 2017 by Emily Hundt and filed under sewalong, sewing tutorials, the collins top and tagged sewalong collins top sewing tutorial.